This lone rider has his hands full as he frantically drives his steed ahead and pulls his pack horses with him up the rocky terrain. With the angry grizzly about to attack, the desperate cowboy has no time to spare in trying to escape the huge, lunging bear. Man and horse may not be much of a match for the girzzly's ire and strength. Let's hope the rider and his horses are faster than the bear in this amazing scene. 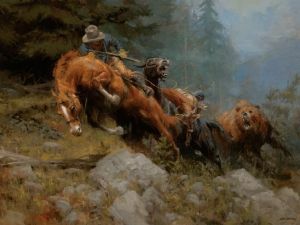 Andy Thomas's work has been compared to the late Remington's for the wonderful action and stories in his images.